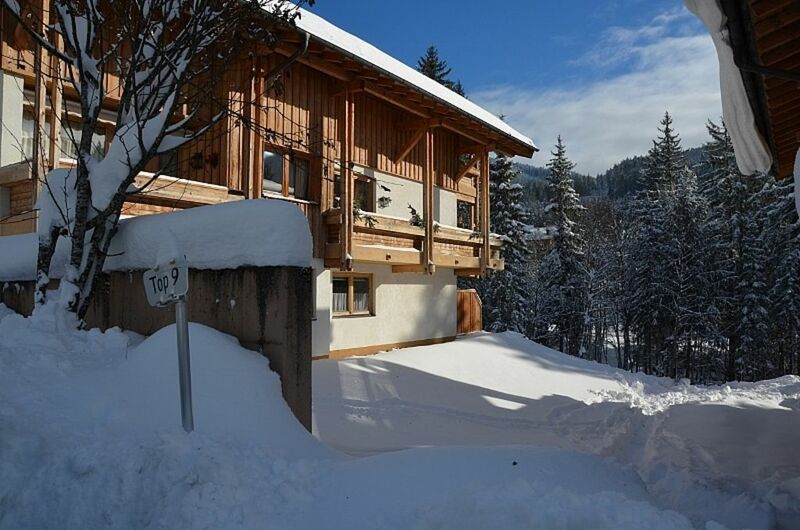 This newly renovated apartment is on the ground floor of a chalet in a peaceful location with a view from the terrace of the mountains, and a shared garden sloping down to a stream. It has 2 bedrooms, a fully fitted kitchen and breakfast room, lounge with TV & double sofa bed, newly renovated bathroom and separate WC. It has a skiboot warmer/dryer for 6 pairs of boots and a shared ski-room. There is free WiFi. Hinterthal is a quiet village at the head of a valley, with a variety of restaurants, a ski school, and rental options for skis and mountain bikes. It is in the heart of the Hochkoenig ski region, part of the vast Salzburg ski region, and famous for the Koenigstour (King's Tour), voted the best ski circuit by Skiresort.info. A short 5 minute walk brings you to the main ski-lift, and 5 minutes the other way there is a practice lift for beginner skiers. In summer it is perfect for walking, mountain biking, or just sitting on the patio listening to the stream! A 10 minute drive or bus ride brings you into Maria Alm with more shops, restaurants and supermarkets. It is one hour from Salzburg airport. In the winter high season we rent from Saturday to Saturday but in summer we are flexible with arrival days. PLEASE NOTE: There is a 50 euro cleaning fee to be paid to the housekeeper in cash on arrival, and also 10 euros per person for bedlinen and towels. Local tax is 1.55 euros per person over 15 years per night. We are a British couple living in Belgium, where we have been as teachers for almost 30 years. We have 4 children, 3 girls at university and our son on his way. We have skied as a family since the children were small, and it has always been our dream to have our own place in the mountains. We chose Hinterthal for its peaceful location, fabulous skiing and lovely Austrian village atmosphere. We bought it in May 2014 and spent July renovating it. Even though we were working we loved the fresh air, the warmth of the people and the constant view of the mountains. The apartment is close to the lift, the village, restaurants and 2 very nice spas, but most of all it is peaceful and beautiful everywhere you look. All you can hear is the stream at the bottom of the garden. Then you can follow the trail up the mountain behind to the waterfall. Hinterthal is idyllic, but if you want more action its an easy drive or you can hop on a bus and you are in Maria Alm in 10 minutes. There is plenty to do, including hiking, swimming, tennis, mountain biking, horse riding.... and you can find lakes, gorges, and glaciers within a half hour drive. For something different, it is only an hour to Salzburg, and that's a city worth spending time in! toilet, shower, New May 2016! Bathroom with shower, washbasin, wc, hair dryer. Separate wc with washbasin and shaving point. All brand new in May 2016. Linens and towels are provided at a cost of 10 euros per person. 2 sofas, easily converted into one double or two single beds. TV and internet connection. Free WiFi. All new kitchen (Aug 2014) with hob, oven/microwave, fridge, freezer, dishwasher, toaster, kettle and coffee maker. Fully equipped with dishwasher-proof pans, 6-8 place settings and utensils. Seating for 6. Breakfast/dining area for 6 people. Lots of board games in the cupboard in the second bedroom. Terrace leads onto garden with a stream at the bottom, but beware the garden is very steep! If you bring your own bike you can store it in the cellar. Bikes and e-bikes are available to rent. Great mountain biking area! South-facing terrace (16m2) with table, chairs and deckchairs in summer. Barbecues are not permitted. Fabulous skiing opportunities for all abilities, and good for families. (www.hochkoenig.at) There is a beginners slope in the village, a ski rental shop and ski school. The Hochkoenig region connects 4 villages in continuous lifts and ski runs, and the King's Tour is a 32km circuit across mountain tops and valleys with spectacular views. It is 5 minutes walk from the apartment to the new, modern 6-seater chair lift into the heart of Hochkoenig. The region received 18 awards in 2014, and the Koenigstour (King's Tour) was voted the best ski circuit by Skiresort.info, the world’s largest test portal for ski resorts. See www.skiresort.info/ski-resort/hochkoenig/test-report/ . If you are here long enough to have covered the whole of Hochkoenig, then your ski pass will also take you all over the Salzburg region. Tennis courts in Maria Alm, 10 minutes drive away. Entrance hall includes electric ski boot dryer/heater. Basement has drying room and ski room. There is space to store bikes. Adaptors for UK plugs and a cable for a computer charger are available in the lounge. Nice little apartment in a small quiet village. Very well situated and convenient location. Would surely rent it again. So happy you enjoyed your stay. We look forward to welcoming you again! Towards the end of May 2018 is when we stayed at this apartment for 3 nights. Didn't even know there was a river that ran through the trees about 50 meters away from the back yard. The moon was full that weekend and it came up just above the mountains beyond the river in the back, making those nights very magical. I was very impressed with the surrounding and the drive up here through the Alps was just breathtaking. I am already planning another trip down to the same location within the next year. Absolutely stunning! 'Breathtaking' is certainly the word! So glad you enjoyed your stay. We look forward to having you back any time! Hinterthal is a very picturesque village with bars and restaurants. The apartment is very comfortable, tidy, well-equipped and big enough for a family of 5. Amazing views from the terrace, you can see the slope and lifts through the living room window. Very friendly and pleasant hosts and caretakers. This was a very relaxing place to stay. Walking distance of local pubs and restaurants, very clean and modern, quiet, beautiful scenery, host met us at apartment to let us in and showed us around. Beds were spacious and comfortable. Well supplied kitchen. TV and WiFi worked great. Mountain scenery was awesome. Doctor, pharmacy, grocery store and restaurants were listed in guide book. We needed them all. I would recommend staying here to my friends and I would stay here again. So glad you had a good time. Thank you for your comments. I hope we will see you again in Hinterthal! Wir waren sowohl mit der sauberen Wohnung als auch mit der besonders freundlichen und hilfsbereiten Vermieterin sehr zufrieden! Die Wohnung liegt ruhig und beschaulich in einem Mehrfamilienhaus (alles Fewos, denke ich) an einem kleinen Flüsschen bzw. Bach, dennoch zentral für diverse Ausflüge ins Umland. Although we come in Hinterthal for years, it was the first time we stayed in this appartment in "Alpengluhe". The appartement was modern, comfortable and complete. There was even a ski booth heater! We slept very well in the beds. It was nice to stay nearby the ski slopes and restaurants in the village. The complex was quiet en the view with snow is amazing. It also had a cellar for the ski's. The owner was very helpfull with our questions and also the welcome was good organized. We had a wonderful week with skiing, tobogganing in Jufen and riding with a horse sleigh in the beautiful forest nearby. But most of all we enjoyed the wedding from our niece in the Jufenalm. It really was a winter fairytale. So glad the wedding went well - what a special place to get married in! Thank you for your review. We are delighted everything went so well for you. Do come again! Nearest airport: Salzburg - one hour by car. Train: from Salzburg to Saalfelden, and then bus to the end of our street. There is a regular bus service summer and winter into Maria Alm and Saalfelden for shopping. It is 10 minutes drive or bus to Maria Alm (8km) which has an outdoor swimming pool, tennis courts, horse riding, biking, archery etc. It is 30 minutes to Zell am See for boating, indoor swimming pool and an indoor ice rink, and 40 minutes to Kaprun with its glacier. There are many other attractions (ice caves, gorges) nearby. It is one hour's drive to Salzburg. The village also has 2 spa hotels offering swimming, sauna and jacuzzi. There is a bank with an ATM at the bottom of the road. Booking Notes: There is a 50 euro cleaning charge and 10 euros per person for linen and towels to be paid in cash on arrival. Local taxes are 1.55 euros per person per night over 15 years old. This is also paid in cash on arrival. A reservation contract will be sent to you on enquiry. Payment can be made via this site or by bank transfer in euros or GB pounds. No smoking, no pets please! Buchungshinweise: Es gibt eine 50 Euro Reinigungsgebühr und 10 Euro pro Person für Bettwäsche und Handtücher. Diese werden in bar bei der Ankunft bezahlt. Ortstax ist 1,55 Euro pro Person pro Nacht über 15 Jahre alt. Dies wird auch bei der Ankunft in bar bezahlt. Nicht rauchen, keine Haustiere bitte!